The MX Fiber Marking System series fiber-based marking system was created to combine the finest elements of Galvo systems and gantry systems. The MX Fiber Marking System series was created as an alternative to Galvo systems for marking applications where part size or automation is not feasible. The system is an immensely productive machine with very large working areas available at very competitive price compared to other Galvo systems. 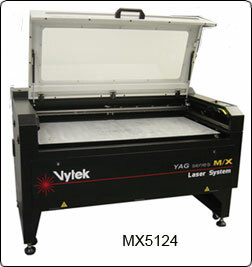 There are 3 MX models to choose from, with available working areas of 12” x 24”, 24” x 36” and 24” x 51”. There are tons of advantages of using a Gantry marking system like the one available in the MX Fiber Marking System. By utilizing a fully-loaded table, an operator can walk away from the process and have time to do something else. The MX boasts a smaller spot size than a typical Galvo system—fully capable of cutting light metals (model and power dependent). The cost of operation is very low with the system operating at 110 volts and using as little as 12 amps. It also requires very low maintenance and generates little noise. With it being a fully-enclosed system, it can be put almost anywhere. Most importantly, the system is very cost-effective and easy to use!